I’ve been wanting to transition to more natural cleaners… but I have sooooo many bottles of cleaners that are perfectly good. My first thought was not demoting them to the garbage… I really did try to give them away first. I went back and forth for so long because I had so much of some things & felt it was wasteful to throw them away… but they weren’t getting used! I like the simplicity of having one spray bottle of cleaner for almost everything. So, I’ve revamped my cleaning supply shelf – and low & behold, getting rid of all this (above) and replacing with this (below) created a TON of extra space! Okay… so what’s my system? 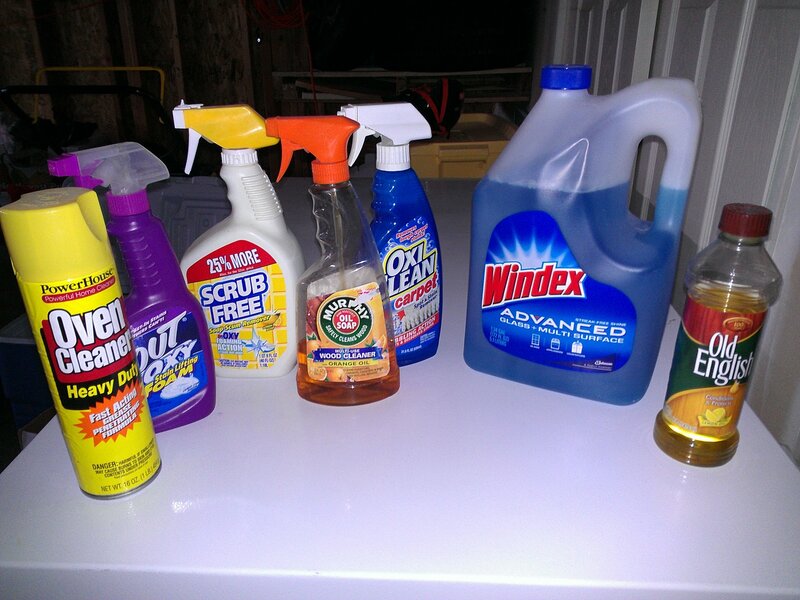 UPDATE: The Spray Bottle is important… vinegar will rust the components of most cheap bottles. I love these from Walmart. 50/50 White Vinegar & Water with two squirts liquid dish soap & one drop green food coloring (WHAT?) … Well, that’s just to differentiate easily between the few things I have on the shelf! Color it red, pink, or don’t color at all. Uses: Wiping down counters, tables, walls, appliances, fruits & veggies with the skins on. Cleaning bathrooms, sinks, inside refrigerator/freezer, windows, mirrors, floors, cabinets, drawers, heck, you could probably wash your car with it! This stuff works really well. And guess what… no noxious odors that make you nervous when you’re pregnant, or when your kids are around. And you can store it under the kitchen sink because the worst that could happen is a mild upset tummy if your kid drank the whole thing. Spray on anything you want disinfected. Leave it or wipe it. Combine in a 1 gallon vinegar jug, shake well. The jug is empty in the picture as I make this as needed. Plunge out ALL the water… you may need to use a rag towel to get out the water at the very bottom. Dump in the whole gallon of cleaner. Mix well, apply to sticky stuff & rub with fingers. Effect: Goo Gone + Soft Hands! I think the coolest thing about defeating the urge to not “waste” all those nasty chemicals, is the fact that I can let my little kids help clean EVERYTHING now… I don’t have to ask them to go outside while I clean the bathrooms or mop the floors. 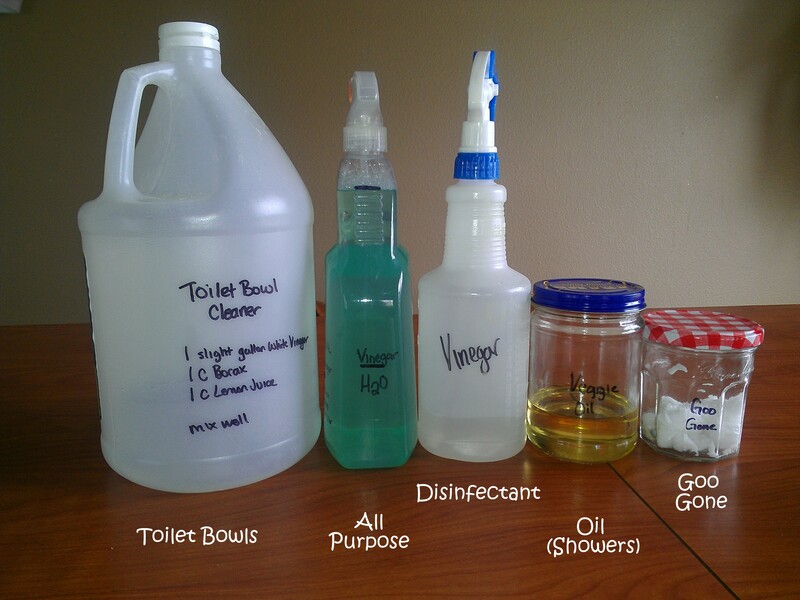 Write the recipe for each cleaning concoction on the bottle! I even go so far as to mark the bottle on the side so I know just how much of each ingredient to put in without having to measure! Now, my cleaning supply shelf is CLEAN… literally! Clean & Green! For more information about why I chose to reduce home chemical useage, check EWG’s list of the most dangerous household chemicals! 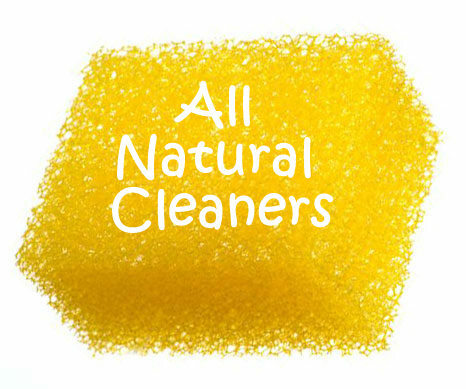 What other natural cleaners do you use in your home?